You can drive from Mendoza, Argentina’s Wine Capitol, to the top of the Andes in one long all- day round trip (242 miles/190 km). Whether you rent a car in Mendoza, hire a Remis (car with driver), or sign up for a tour, this is a road trip you will never forget. When I crossed the Andes from Chile to Argentina in a freight train in 1961, my husband couldn’t wait to show me the highest mountain in his country and in the Western Hemisphere. Aconcagua towers above the Andes at 22,834 feet, and you can gaze up at its 10,000 foot-high wall of granite, topped by five gleaming glaciers and wind-whipped summit from the parking lot at the Parque Provincial on the Uspallata Pass at 10,400 ft. The train is gone, but the road is better; so leave your glass of Malbec on the table in one of the fine wineries or bistros of Argentina’s wine capital, and head for the mountains. 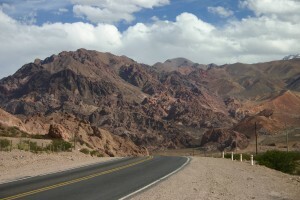 Ruta Nacional 7 (the Pan American Highway, the only road that connects Argentina to the Pacific Coast) follows the Mendoza River into blue-black mountains. In 1934, an ice dam broke from a glacier at the top of the pass, sending mud, rocks and debris down the canyon, destroying every thing in its path including two hotels. After you pass Uspallata, the last town before the Chilean border, the multi-hued mountains rise on either side of the road, followed by dark, brooding mountains. Stop for a photo break where two rivers–Tambillos and Blanco spill out of the mountains and under the road into the Rio Mendoza, Inca tambos (resting places) will remind you that this was once an Inca route from Peru through northern Chile to Argentina. The movie, Seven Years in Tibet, was filmed in the rugged mountains nearby. At Punta de Vacas, corrals that once held cattle en route to Chile lie abandoned alongside a now defunct cog railway. The two countries have discussed re-building that railway from Santiago to Mendoza –an “Andean Express?” Another photo stop–Looking south, Cerro Tupungato’s white cone rises above the Uco Valley at 22,304 ft — 3rd highest montain in the region. 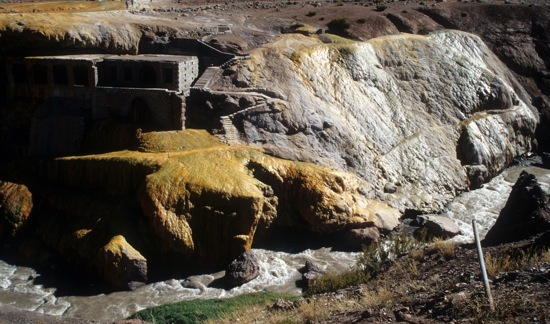 After you pass the ski area at Los Penitentes, named for the rock formations that resemble penitent monks, you will see Puente del Inca on the left side of the road. At 9,000 feet, its red rocks encrusted with yellow sulphur form a natural bridge over the Rio Cuevas. The refugio, where mountaineers hang out before and after climbing Aconcagua, is a good place for lunch and a soak in the hot sulphur springs after visiting the Parque Nacional Aconcaua–just a few more miles past the Argentine customs station. About 9 more miles west of the park entrance, the road forks right to Chile, left to the statue of Christ the Redeemer–a symbol of peace between Argentina and Chile. At 13,800 feet, you can see a lot of Chile! 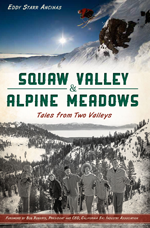 I am a freelance travel/ski journalist, living in North Lake Tahoe, with roots in the San Francisco Bay Area and on the ranch where I grew up. My Tips and Tales from many Trips-- up down and over the Andes, from Peru to Argentina, are what I love to share with family, friends and readers around the globe. And the search goes on—for more trips and more tales. How these two valleys, geographically close but philosophically apart, became one of the best known ski areas in North America.